well, my final day in greensboro arrived early sunday morning. i thought all the crazy fun had already passed, but what little did i know! we had planned to go out for brunch, but seeing as how there was freezing rain steadily building up all around the house and our cars, we went nowhere fast. good thing mary had stocked up on bread and eggs, because a homemade breakfast is just what the doctor ordered. first things first on a lazy and relaxing sunday? mimosas! well, i take that back. we didn’t have any orange juice, so we made ourselves some berry bellinis. step one was to make a little berry puree to complement the champagne. mary whipped out her blender and got a little raspberry-strawberry concoction going. it’s silly how simple it was! step two is to over pour the champagne so that it goes all over the cutting board and chopping block, wasting about a fourth of the bottle. whatever! we never said we were perfect, just a few friends trying to have a good time, and that isn’t too hard with champs and sweets. i think at about eleven o’clock we finally started cooking actual food. first up, sausages! mary had a moment of inspiration and let me in on her sausage-cooking secret: use a panini skillet of some kind, the ones with the ridges. you can place those little sausage links right in between so they don’t roll all over the place. 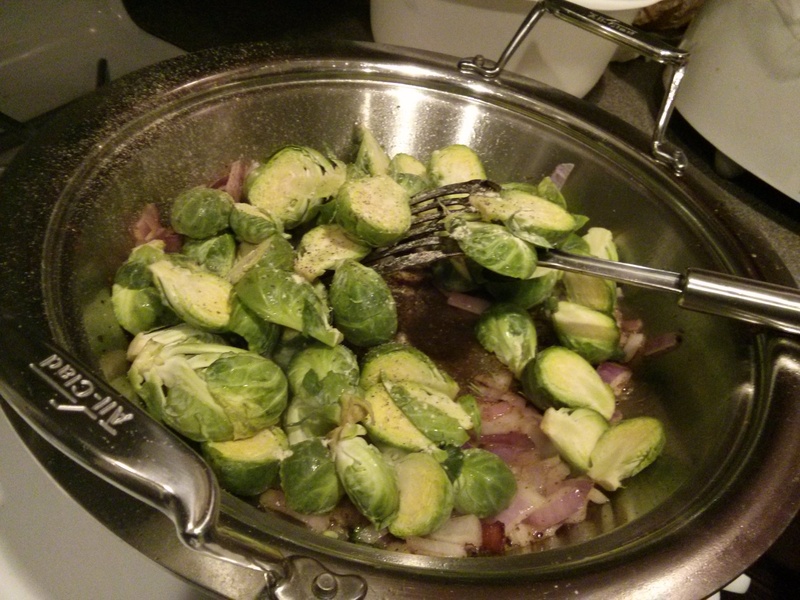 your links will be perfectly browned and juicy, a great side to any breakfast dish. wait, though. what was our breakfast dish of choice that sunday? eggs benedict! this mary lady just does it all – homemade strawberry puree, eggs benedict. man, was i spoiled this weekend or what? mary got out her pioneer woman cookbook and turned to page 16 to find the eggs benedict recipe. this particular recipe, to quote mary, is not particularly “figure friendly.” i mean, there are two sticks of butter in the sauce alone. good thing i’m not on a diet! before we get there, though, let’s take a look at the adventure that was poaching the eggs. i’m sure there’s some exact science to poaching an egg, but we kind of just went on memory and instinct for ours. after the water came to a slight bubble, mike used a wooden spoon to get some good circulation going. mary plopped that first egg into the water and, oh! look at that! that’s not what a poached egg should look like! it looked like some weird mess caught up in an f5 tornado! sooooooo, with that disaster, we dumped the water and started from scratch. this time we brought the water to a very low boil, didn’t stir as quickly, and gently slipped the egg right into the water without causing too much of a commotion. the white of the egg delicately fell in on itself, creating a little envelope for that yolk to cook perfectly. ah, quite the success! mary served them up on soft toast with generous spoonfuls of the hollandaise. the sweetest breakfast ever served! the egg was rich and helped cut out the overly sour lemon in the sauce. now, the hollandaise calls for the juice of two lemons, but the lemons we were using were a bit larger, so i think we probably didn’t account for that. i also thought the sauce was a touch too runny, but that’s just my opinion. regardless, i sopped up all the yolk and sauce with my toast and didn’t leave a morsel on the plate. a great adventure with a great result! we pretty much spent the entire day in the kitchen, drinking and eating our way through the afternoon. we had a hoot of a time reliving the weekend’s already wild happenings as the radio played. all of a sudden, “king of wishful thinking” by go west came on and mary squealed, nearly scaring mike and i off our chairs. “i love this song! i just cannot control my body when i hear it!” after listening and dancing to it, we pulled up the video online. i think we love it now even more, but i’ll let you be the judge! 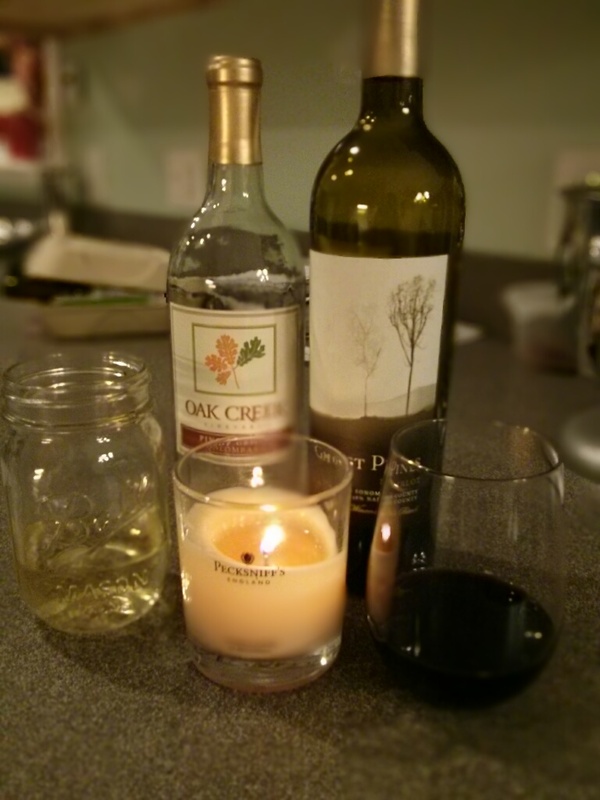 aaahhh, the early evening was suddenly upon us, so mary and i switched to wine for the rest of the night. she’s a white wine lover and i’ve come to love red. good thing she had plenty bottles of both! even though we’d had a late brunch, our stomachs were starting to growl. well, just what would we have for dinner? 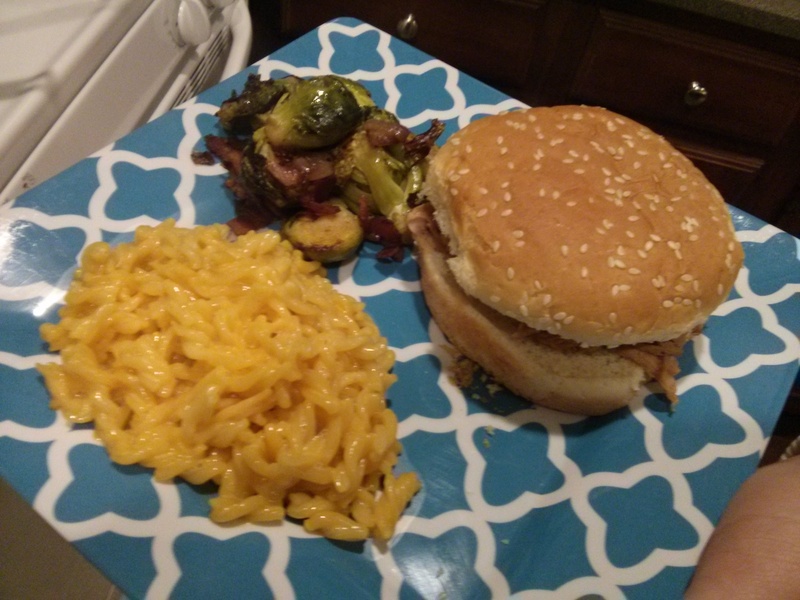 mary had started a pork tenderloin in the slow cooker that morning, so after some serious thinking, we decided pulled pork sandwiches, mac’n’cheese, and brussel sprouts would be a great idea. am i, right? yep! 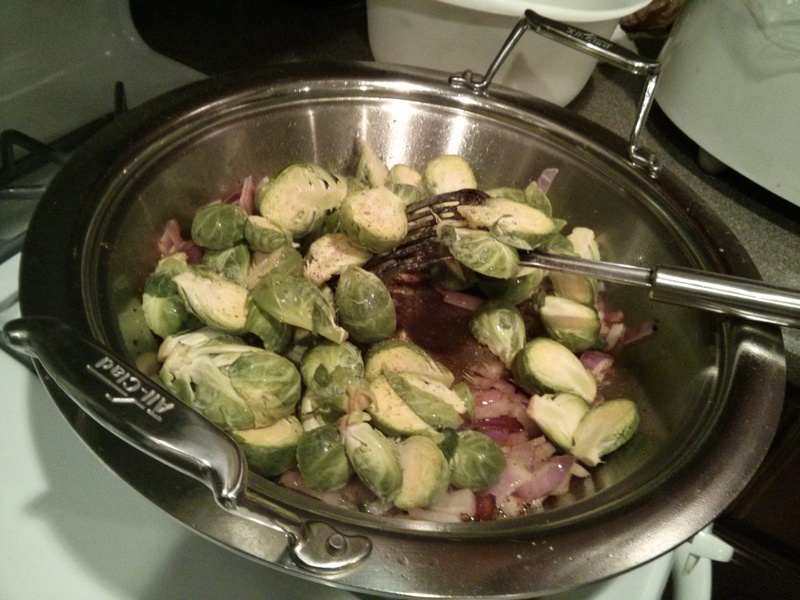 mary had some red onion she needed to use up, so we figured we’d throw ’em in with the sprouts. mary armed herself with her onion glasses, looking like a regular pro. just check out those perfectly chopped chunks! 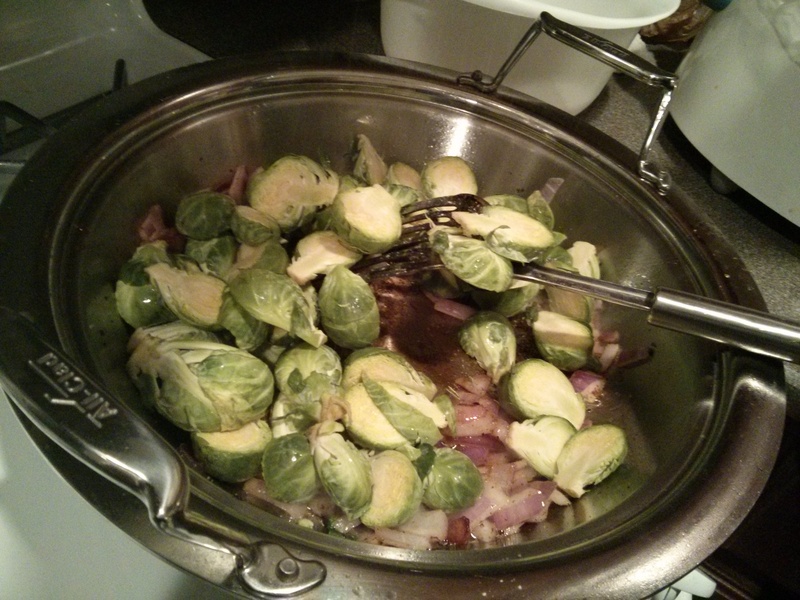 next we got the pan sizzling and browned the bacon (because bacon makes everything better) and softened the onions. the kitchen started to smell divine, as i am sure you can imagine. 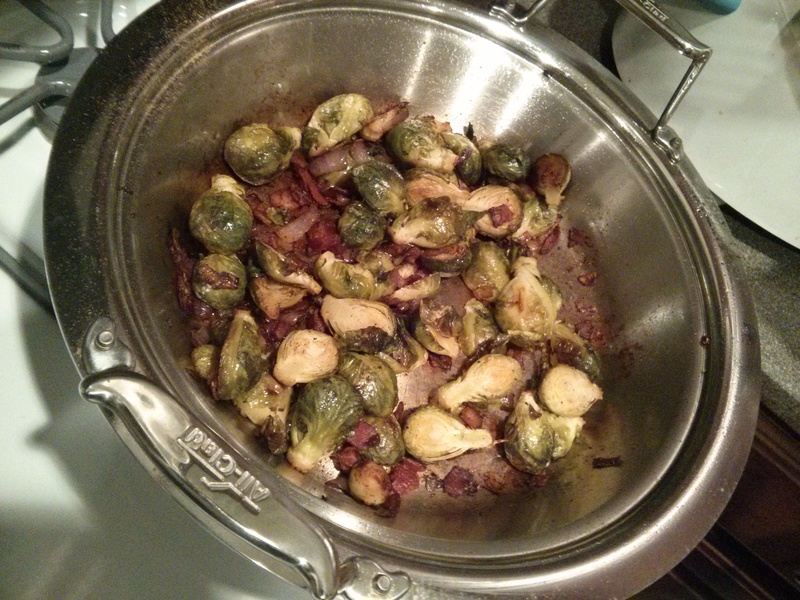 mary gave the brussel sprouts a rough chop and tossed ’em in with the bacon and onions. 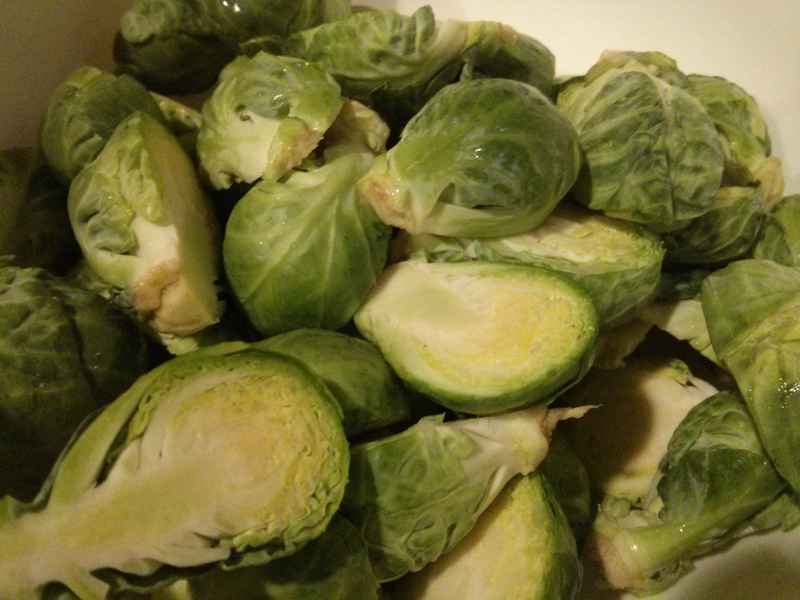 it’s such a shame brussel sprouts get such a bad rap. they just needed to be served with fatty bacon all this time! …and then when they’re all ready! we finally had everything ready, so we dug in and spent the rest of the night watching old home videos that mary’s dad mark had filmed at the 1996 olympics in atlanta. ah, we were so young! eventually we rinsed our plates, filled the dishwasher, and headed to our beds. i cannot express enough thanks to mary and mike for a fantastic weekend, and my heart swells just thinking about how much i love these dear friends of mine. without any plans written down, we let the days take us where they would, which was, as i had hoped it would be, a lot of fun.